When using containers to build large infrastructure deployments, there might be ways to circumvent the risk that running containers as root introduces. The use case I present here is different: I want to only use a single container image on a network management server being used by multiple users. These are just regular users on the server, and by no means should they have anything resembling root access on this server, whether it be by design or by vulnerability. Containers are not fully virtualized instances. Instead, they make use of the same kernel and file system as the host operating system. This means that anything to do with your Docker containers that’s running as root is also a risk to the host OS and possibly other systems too if they are reachable from the host OS. Obviously, this behavior is highly undesirable outside of labs and development environments. So what can we do about it? Simply providing sudo or root permissions to the user is not an option, as doing so will open up the whole system to malicious or careless users. On the other hand, without access to the Docker daemon, we can’t do anything at all. It’s obvious we need some way to provide more privileges without opening up the entire system. When researching this, I found that it’s possible to provide sudo permissions to specific commands or files. This is done not by granting a user membership to the sudo group, but by applying specific permissions to a user or a group in the /etc/sudoers file. In this way, you can restrict sudo access to specific commands or files. You can also set it up so that a password is not needed when executing the specified sudo command. This is starting to sound good. Providing sudo access to just these commands is part of the solution, but it’s not good enough. In essence, the whole system would still be open to abuse by containers running as root, possibly with any part of the local file system mounted into (and thus accessible from) a container. To prevent this, it’s possible to write scripts to operate the Docker commands with certain restrictions. If you then place these scripts outside of the control of normal users, you can restrict the possibilities for abuse. More info about this, including examples, will follow later in this post. For now, let’s focus on the second security risk: containers that run as root. By default, any Docker container is initiated as root. The UID of the root account on the host system gets mapped to the same UID inside the container. Because code in the container runs on the same kernel and file system as the host system, any part of that host system that is accessible inside the container can be touched with no restrictions. Because Docker bind mounts can be used to mount any part of the file system of the host OS into the container, you can see how this gets hairy really fast. The solution is to start containers with a different UID, preferably that of the regular user that does not have any unsafe permissions on the host system at all. echo "Executing command: docker image ls"
echo "Executing command: docker ps -a"
This should be easy enough to read. Basically, only two useful commands are being run. First “docker image ls” to print the local Docker images available, then “docker ps -a” to list the containers that currently exist. Via /etc/sudoers, users in docker-users get access to these commands. Docker-users don’t have the option to provide any arguments to the docker commands that get executed, they only have the right to execute this script as it is. They also don’t have permission to edit the script. They can’t make their own script, since the path to that script will never have the sudo permissions. Finally, the “NOPASSWD” setting makes sure the sudo commands that are being allowed do not ask for a sudo password when being executed. # This runs the container..
# ..executes the command provided as an argument to $1..
4.3: The second bind mount statement maps the ~/docker folder of the original user to the /projects folder within the container. Within their ~/docker folder, users can place the scripts and data that will be needed within the container. 4.4: The third bind mount statement is needed if Ansible is used within the container. Not having this location available makes Ansible return errors. 4.6: The “-it” options tell Docker to run the container in the foreground (Interactive) and to attach a Terminal to it. Because this particular command removes the container right after finishing its commands, this puts any output of the container commands into the users shell. 4.9: The $1 variable accepts an argument. At this place in the docker run command, Docker expects a command that the container should run for you. By calling this script with sudo, the user can provide an argument with the script. This argument can contain the command that the container should execute, and will be passed within the script to the docker run command at this location. The $1 name is bash syntax for the first argument that’s passed by a user. Because bash splits arguments by spaces, single commands consisting of more words should be enclosed within double quotes. 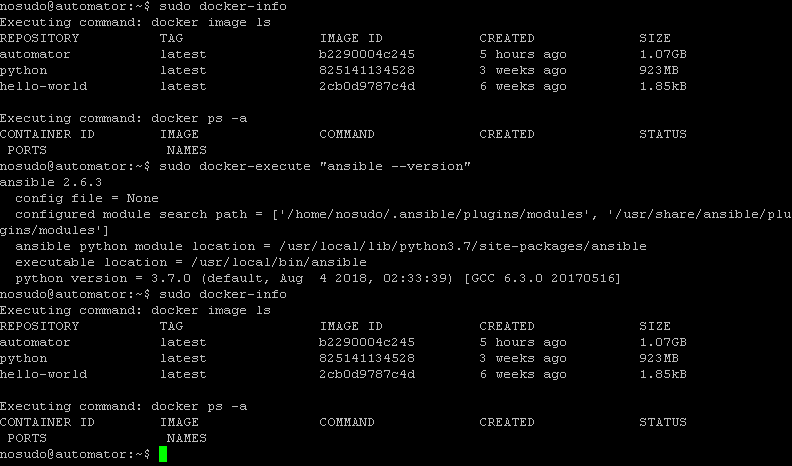 Here is an example: sudo docker-execute "ansible --version"
Here is another example: sudo docker-execute "python3 nornir_script.py"
The screenshot first shows in the output of docker-info that no containers currently exist. Then, docker-execute is used to spin up a container, have it run “ansible --version“, then remove the container again. The output of docker-info shows that no containers exist after running the previous command indeed. I believe this simple project provides a way to use Docker on a management server without getting in the way too much. This solution should be portable to a lot of different Linux systems, as long as the kernel is recent enough to support running Docker on it. I’ve tried to restrict possibilities for regular users to mess with the server as much as possible. In case I left an open door, please leave a comment and I will try to figure out a way to close it. Here are some closing notes on the security topic. I’ve tried to see if the nosudo user can elevate to sudo from within the container but that does not work. It is also not possible to pass an extra bind mount command as an argument to the docker-execute script (the only script in this set that processes any arguments at all). The main reason this does not work is that the argument gets added to the end of a docker run command, and docker does not accept bind mounts or other options in that place. I believe that only a command to run inside the container is accepted in this place of the docker run command. While this gives some added security by dumb luck, it would be better to perform some kind of input sanitization. Maybe that can be done as some extra steps in the shell script, but I’m still looking for clues on this. The last part that opens up possible vulnerabilities are the bind mounts to local folders in the users home folder. If the user deletes these folders and replaces them with symlinks to other parts of the host OS file system, those file system parts will get mounted in the container. This should pose no immediate risk though because the user has the same permissions on the file system on the host OS regardless of code being run from within the container or directly from the host OS. As far as I am able to determine, this setup is pretty tight. As seen in the examples in this post, I’ve provided two different ways of using the container for your scripts. The first is to just have the container run the script and get removed again right after. The second is to keep the container running, connect to it and do things. I am not yet sure of which is the superior way for network automation use cases. It seems simple enough to support both methods, so time will tell what the preference will become. Thanks for reading and please feel free to leave any comments or questions.